Washing of the Feet by Duccio, 1308. During Lent we have looked at several events that took place as Jesus journeyed towards Jerusalem. During this time in his ministry, as the cross drew near, he labored to show his disciples how his kingdom was radically different from the world. In no way does the kingdom of Christ differ more from the world than in its expression of authority. Because of the influence of sin, authority often produces abuse and strife. Just like in the children's game "King of the Hill," those at the bottom fight to get to the top while those at the top fight to keep their place of power. But in our passage this week, Mark 10:39-45, Jesus says that those who have or seek authority in the kingdom must live as slaves of all. What does that mean for your life at home, in church, and at work? What does it mean for our church as we try to call our neighbors to faith? Come worship on Sunday, and let's hear what the Spirit has to say to us! "Greed, for lack of a better term, is good." Michael Douglas as Gordon Gekko from the 1987 film Wall Street. And greed - mark my words - will save the USA. Greed does drive many to work hard, create, and explore. It can inspire virtues like resilience and wise practices like saving money. Greed even promotes a great deal of charitable giving from people anxious to get tax breaks! Given these truths, why, then, does Jesus tell us that there is no greed in the Kingdom of God? Why does he say, as he does in this week's passage (Mark 10:17-27), that it is impossible - apart from God's power - for a rich person to enter the Kingdom? And if that is true, what hope is there for us, who live in the richest nation in the history of the world? Let's come together this Sunday and listen to Jesus! He will tell us again of his great love, reveal to us the nature of true riches, and call us urgently to follow him. Did you grow up with siblings? If so, you may have memories of long car rides in the back seat with your family. One of my memories growing up as a kid involves fighting in the back seat during a road trip. Inevitably, all three of us would all end up hitting or poking each-other. And then it happened. Mom or Dad would whip their head around and sternly say, "Benjamin Daniel. Don't touch your brothers!" The law was laid down. Being the compliant child I was, I would submit. Well... let me rephrase that. I would proceed to put my hands as close as humanly possible to my brother, maybe even touching his shirt. Technically, I was submitting to the letter of my parent's command, but in reality I was finding a way to maneuver around my parent's wishes to do what I wanted. Our sermon text this week, Mark 10:1-12, involves the Pharisees approaching Jesus in order to test him. They ask him bluntly, "What does the law teach concerning divorce?" They knew the debate about how to interpret God's law regarding divorce was hotly contested. They thought they could force Jesus down on one side. But Jesus answered in a surprising way. Instead of taking the bait, he turned the spotlight on the hard hearts of the Pharisees. He revealed that the Pharisees were so embroiled in debates about when divorce was permissible that they were ignoring God's good and perfect design for marriage in the first place. He showed that the Pharisees were so caught up in looking for ways around God's laws that they had little time to delight in his design. Join us this week as we worship Christ our King, and turn to the Scriptures to consider that there is no hardness in God's Kingdom. For the second Sunday of Lent we will continue to explore what’s NOT in the Kingdom of God. Our passage, Mark 9:42-50, focuses on the sin of sloth. Sloth has no place in the Kingdom of God. Sloth is not the same thing as laziness, though laziness often results in sloth. Sloth is a lack of zeal for the things of God, a satisfaction with the state of our souls and the world that causes us to settle for far less than what God offers and commands. Sloth afflicts those who are drawn to sin or have grown weary in their struggle against sin. Chances are that you’ve been in one of those camps before. Maybe both? Maybe even this week? Come Sunday and be awakened and rejuvenated by the voice of Jesus! In the Bible, God uses leaven (or yeast) as both a negative and a positive image. Negatively, leaven represents the pride which resides in a sinner’s heart. Positively, Jesus compares the Kingdom of God to a tiny pinch of yeast that leavens an entire lump of dough. The hope of the Gospel is that the leaven of pride, which has corrupted every human being and every corner of the world, can and will be displaced by the leaven of the Kingdom. In the Old Testament, God gave the Israelites an entire festival week during which they were to have no leaven in their homes. The Feast of Unleavened Bread reminded the people of the Exodus, when God humbled the pride of the Egyptians. It also called them to “walk humbly with their God” (Micah 6:8) – to avoid falling into the same trap as their former masters. Clearly, God places a premium on guarding against pride and repenting of it whenever it wells up. The New Testament contains similar warnings and exhortations about pride, but instead of being grounded in the Exodus they are grounded in Jesus. Jesus’ life embodied humility and all of its glory. He willingly shed his heavenly glory to become human, lived contentedly for years in obscurity, preached to crowds without longing for their approval, suffered the injustice of the cross without complaint or bitterness, and through all of this never ceased to love perfectly each person that he met. No wonder that Paul tells us to “have this mind among yourselves, which is yours in Christ Jesus” (Philippians 2:5)! Paul tells us to imitate Jesus’ humility not only because it’s compelling, but also because it’s strong. Compared to the humility of Jesus our pride is a weak and paltry thing. Pride reduces us to self-absorbed people who rage or flee in the face of hardships. Meanwhile, Jesus’ humility enabled him to endure bravely the worst that life has to offer. Pride promises glory but sends us to the grave, reduced again to dust. Meanwhile, it was because of Jesus’ humility that the Father raised him from the grave, exalted him, and gave him “the name that is above every name” (Philippians 2:9). Lent presents us with a wonderful opportunity to renew our repentance from pride. Begin by studying Jesus. Do this unhurriedly and in a quiet place, but don’t obsess about how much time you spend. Simply read some stories about Jesus in the Gospels and meditate upon his words, actions, and character. Imagine the scenes you read in your head. Put yourself in the place of some of the characters – proud ones like the Pharisees (Luke 18:9-14) and the disciples (Mark 9:33-37), and humble ones like the people Jesus rescued from shame (Luke 7:37-38), blindness (Luke 18:43), and demons (Mark 5:18). Ask yourself who seems more joyful, strong, and free. Ask yourself who you would rather be. But can simply studying and meditating on Jesus make us humble? Yes! – because Jesus is not merely our example, he is our Savior and our life. The Scriptures declare that we have both forgiveness and power because of Jesus’ humble obedience on the cross. Through the Son we who believe are forgiven by the Father and filled with the Holy Spirit. Pride no longer defines us, because our life is now “hidden with Christ in God” (Colossians 3:3). We can be confident that every desire we have to imitate Jesus’ humility comes from the prompting of the Spirit, and that every effort we take to follow those promptings will bear fruit in its season. “The one who sows to the Spirit will from the Spirit reap eternal life” (Galatians 6:8) – not just in the world to come, but also in the present. Confess and turn from your pride – the humble one who dwells within calls you and will enable you! The first Sunday in Lent moves us into a new section of Mark's Gospel, one where Jesus teaches us "What's NOT in His Kingdom." Our passage this Sunday, Mark 9:33-37, shows us that pride has no place in Jesus' presence. I doubt any of us have come as close to the top of our professions as Muhammad Ali did in his, but we are still not so different from him. The same pride which Ali showed in his boasts and his cruel denigration of opponents dwells within us, desperate to be recognized and honored. Therefore, let us come together this Sunday before Jesus, the only great one, who can free us from our pride and crown us with glory that will never fade. Yesterday marked the beginning of Lent, the forty days prior to Easter (excluding Sundays). We will observe the season with new stage colors, sermons about Jesus' teachings on repentance, and weekly emails and blog posts to help you draw near to the Lord and prepare for Easter. Lent is often thought of as a time of giving up some "guilty pleasure" in order to show our devotion to God. Chocolate, alcohol, sodas, and red meat usually top the list of Lenten fasts. However, God makes plain that fasting for the sake of fasting doesn't impress him. Instead, He wants us to fast from sin and then to feast on showing love to our neighbors, especially those most burdened by pain, poverty, and injustice (Isaiah 58:1-12). When we tie fasting to this great purpose, amazing transformation can take place. We can connect our physical hunger to God's Kingdom - using our stomachs and taste buds to remind our hearts to hunger and thirst for righteousness. Much of our repentance is reactive, turning back to God after we have sinned. Lent, however, enables us to repent proactively, before we have done something wrong. Lent gives us an extended period of time in which to take stock of our hearts, to reflect on the perfection and amazing mercy of Jesus, and to ask him to align our desires with his own. Used properly, Lent not only prepares us to celebrate Easter but to live in the power of the Holy Spirit. What could be more precious? As a church not accustomed to observing Lent, our first efforts may seem awkward. Remember, however, that God always draws near to those who draw near to Him (James 4:8), and always rewards those who seek Him (Hebrews 11:6). He does not demand that we "get it right," only that we move towards Him in faith, knowing that He is pleased with our repentance because of Jesus. Let's seek His face together in this season of renewal! This Sunday, we will finish the first half of our journey through the Gospel of Mark. Our passage, Mark 9:2-8, tells the story of the Transfiguration, when Peter, James, and John caught a glimpse of Jesus' full glory. In the Gospel story, the Transfiguration comes immediately after Jesus explains to his disciples that he must die at the hands of his enemies, and that they must take up their own crosses and follow him. As we will see on Sunday, this sequence is important. Alone, the challenge of the cross can offend or intimidate; when combined with a glimpse of Jesus' glory, the cross makes sense, and even becomes beautiful. As a melancholy person, I often fail to see or even search for glimpses of Jesus' glory in my world. Perhaps some of you share the same weakness? Pray for our time on Sunday - our songs, prayers, readings, and sermon - that through them we would see Jesus' glory and be moved to love and worship him anew. About 2,000 before Jesus came to earth God began to reveal to Abraham what I believe is, from a human perspective, the most startling and perplexing idea in the history of the universe. This Sunday, in the eighth chapter of Mark, we will hear Jesus try to help his disciples understand this divine truth in greater detail. What is this startling idea? 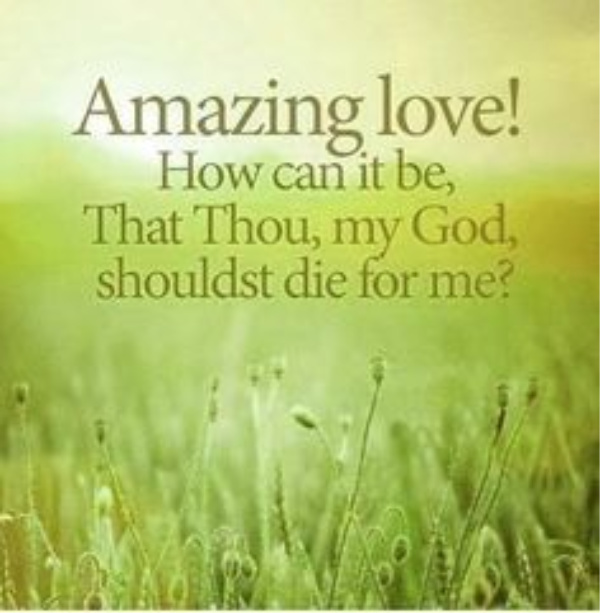 I think Charles Wesley came as close to capturing the depth of its perplexity as anyone when, in 1738, he wrote the words to one of his most treasured hymns. Calvin may be cute, but he’s wrong! You can’t obey the letter of the law if you don’t obey its spirit. Humans have divided up into tribes ever since sin entered the world. Unlike those in ancient times, modern “tribes” aren’t limited to blood relatives, nor do they exist to ensure survival; they are cliques centered on shared activities, interests, and ideas. As Christians, we are members of the most important tribe on earth –the Kingdom of God – and our tribe’s hero, King Jesus, sets the standard for determining who’s in the Kingdom and who’s out. However, we frequently prioritize other tribes more than the Kingdom, and often create our own requirements for Kingdom membership. What happens to us and to the Kingdom when we do this? Many would call New Hope an "evangelical" church. That word can conjure up several different meanings. For some, "evangelical" means "politically conservative," while for others it means "hip and entertaining." In fact, "evangelical" comes from the Greek word we translate as "gospel." In the New Testament, the Gospel is the proclamation thatJesus is Lord. Therefore, allow me to suggest what the word should bring to mind: an evangelical church is one that believes that Jesus is Lord, loves because Jesus is Lord, and proclaims the message that Jesus is Lord. Now that we have the definition, let's ask a big question: is New Hope truly an evangelical church? It's my perception that we excel in the first two parts of the definition; we believe that Jesus is Lord and strive to love because Jesus is Lord. However, we are not nearly as strong when it comes to proclaiming that Jesus is Lord. As we will see in this Sunday's passage, Mark 6:7-13, 30, proclaiming to those around us the Lordship of Jesus is fundamental to our faith. Proclaiming the Gospel is not a duty, but an essential way that we imitate and enter into the joy of our Savior, who could not help but speak the words of life that he received from his Father. Come and worship this Sunday because of the Gospel! A King and a Fool - but which is which? A court jester - often called "the fool" - appears in many of William Shakespeare's plays. Shakespeare's fools have more wisdom than the kings that they serve, and they dispense that wisdom subtly through stories, jokes, and mockery that would land any other advisor in the dungeon. In the Gospel According to Mark, we find the situation reversed. Jesus, the King, seems foolish to his "court" (the disciples and crowds who follow him). King Jesus advises his followers through parables, describing the true nature of his kingdom in ways that only those "with ears to hear" will understand. This Sunday's passage, Mark 4:1-9, includes one of the most famous of these stories - "the Parable of the Sower." We will explore why this parable was so important to Jesus and why it seemed foolish to his hearers. In the end, we will find hidden in plain sight some tremendous wisdom about Jesus, his kingdom, and ourselves. Come and worship! Having trouble remembering someone's name at church? Here's a pro tip from me to you. When approaching, look the person square in the eye, give a hearty handshake and say, "Good morning, sister!" or "Hey there, brother!" Note: for children, substitute "sport" or "champ" for brother/sister. Growing up in church, I always took for granted the way people called one another "brother" or "sister." "That's just how older folks speak to one another," I thought. But as I grew older, I learned there is a rich, deep significance to the title "brother" and "sister." It's not merely a spiritualized fill-in title for those whose names we don't remember. No, it is an objective truth, pointing to the "mystical union" we share together in Christ through the Holy Spirit. We are indeed part of the family of God, sons and daughters of the Kingdom, sharing more together than we often realize! Our sermon text this week - Mark 3:13-21, 31-35 - deals with the question "Who is in the King's family?" Join us Sunday as we worship the Triune God who has adopted us into his family through the person and work of Jesus Christ! No doubt many leaders have wished that they could replace their subjects, but there has only ever been one leader with the right to do so had he desired. No kingdom made up of sinners is worthy of King Jesus. So who does he make his subjects, and why does he tolerate them? This week’s passage, Mark 2:13-17, tells how Jesus called Levi (Matthew), a tax collector unworthy of Jesus’ attention. In his story we will see how our King reveals his glory by turning the worst people into his loyal subjects. Come and worship with us at New Hope at 10 AM and hear of the power and love that Jesus has for you! 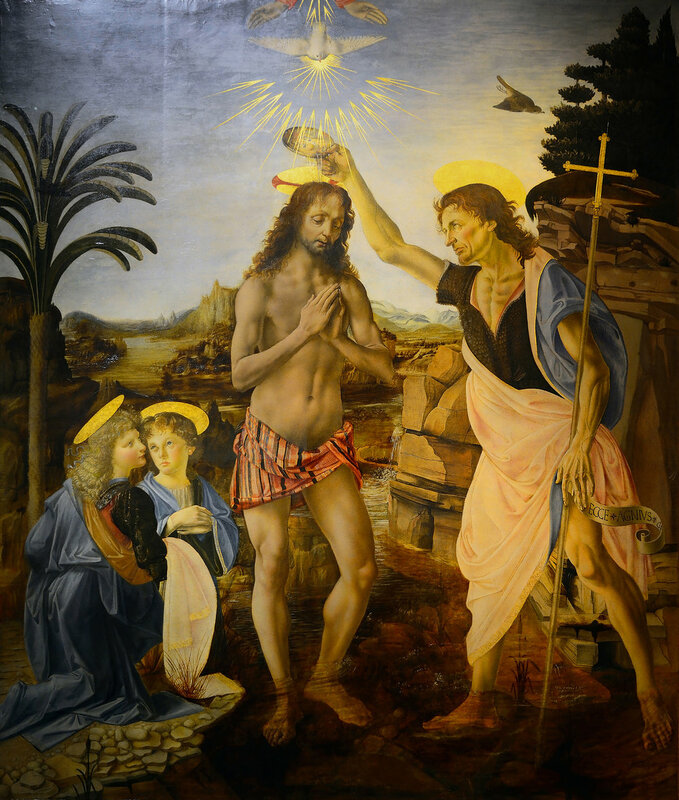 In the Christian Year, the first Sunday after Epiphany remembers and celebrates Christ's baptism. At New Hope will observe this day through the reading and preaching of Mark 1:9-13 which tells the story briefly and powerfully. After an obscure childhood, adolescence, and young adulthood, Jesus came from Nazareth to be baptized in the Jordan River by John the Baptist. This event marked the beginning of Jesus' public ministry and started him on the road to the cross. In Christian baptism we receive a new identity as God's children. Our life without God is washed away and He publicly marks us as His children. If that is what baptism does, then why was Jesus baptized? After all, he was already God's Son before his baptism - not just in his divine nature, but in his human nature. How then did Jesus' baptism change his identity, and why should this matter to us? Come and see! The new year brings with it a new season of preaching and teaching at New Hope. This week we will kick off a series in the Gospel of Mark that will take us through Easter. In January and February, each sermon will ask the question "What's in the Kingdom of God?" This week's passage, Mark 1:14-15, 21-28, gives a simple but confident answer: power. This week we will also begin a companion series in Adult Sunday School on revival. Stick around after worship for lively teaching and discussion! Looking forward to seeing and worshiping with you all again this Sunday! In what way were these men truly wise? What can we learn from their story? 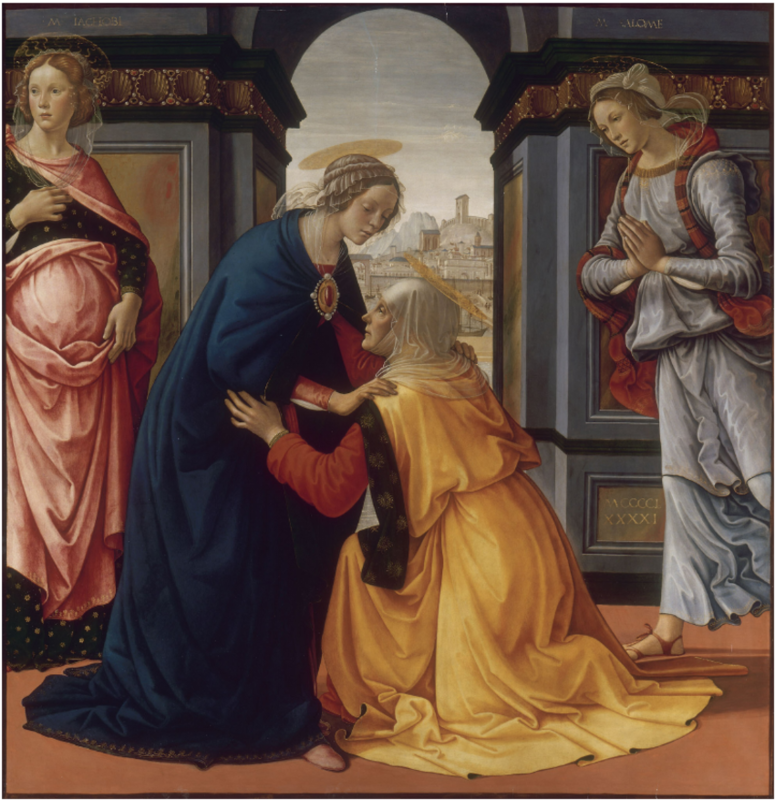 “Visitation” by Domenico Ghirlandaio (1491). Both Mary and Elizabeth answered the Lord’s call to believe what was seemingly unbelievable. Advent concludes tomorrow with a word about faith. Our passage, Luke 1:39-45, introduces us to two women who each believed remarkable promises from God. Their stories demonstrate how all the blessings of salvation flow from this one foundation – faith that answers the faithful promise of God. Come in the morning and worship! The Temptation of Christ (1481) by Michael Pacher. “If you are the Son of God…” Satan used his words to question and thereby slander Jesus. In response, Jesus listened to – and sang – the song of the Holy Spirit. In my previous post, I described how joy arises in us as the Holy Spirit confirms the fact that we are God’s children. When we hear the word of God – whether in a sermon, a song, a prayer, the counsel of a friend, or our own reading and study – the Holy Spirit affirms that word and the fact that it applies to us. The Spirit rejoices over the love that God has for us and calls us to rejoice as well. At this point, some objections may arise. If indeed the Spirit rejoices within us when we hear the word about God’s saving love in Jesus, then why do some Christians hear and rejoice more easily than others? Why can the same Christian rejoice in the Spirit for a season and then find that the things of God have lost their taste? Does this occur because we grow hard of hearing, or does the Spirit sometimes fail to sing? The writer Henri Nouwen wrestles with these questions in his little book, Life of the Beloved. He concludes that while the Spirit never stops singing to us that we are God’s beloved, we must train our ears and our lips if we are to enjoy the melody constantly. First, we are called to reject all other voices – inner or outer – that tell us we are not God’s beloved. Second, we must sing the song of the Spirit to ourselves and to others. We have to dare to claim the truth that we are God’s chosen ones, even when our world does not choose us. As long as we allow our parents, siblings, teachers, friends, and lovers to determine whether we are chosen or not, we are caught in the net of a suffocating world that accepts or rejects us according to its own agenda. Long before anyone heard us cry or laugh, we are heard by our God who is all ears for us. Is this simply positive self-talk? Yes, and no. Yes, it is self-talk, and it is positive, but it is not a bare assertion arising from our own imagination and will. In repeating such words we are repeating the words of Scripture, just as the Spirit does. Not everyone has a right to claim these words as his own. Anyone who thinks himself to be a child of God and yet refuses to follow Jesus remains an enemy of God. Assurance of God’s love means very little to people who have hardly any interest in God. Until a longing for God arises within them they are incapable of any genuine, lasting joy rooted in the knowledge of God’s love. As for those who do long for God, many have no doubts whatsoever about his love while others struggle tremendously to believe it. Both groups draw from all across the Christian spectrum. In either you will find men and women, the rich and the poor, the educated and the uneducated, republicans and democrats, majority and minority races, “raised in the church” Christians and “skid row conversion” Christians. What then accounts for the difference? After they sinned, Adam and Eve hid in fear from God. Hiding, fearing, mistrusting – these are the default settings for the sinful heart. Those who seem to escape this tendency easily can only do so because God has seen fit to give them a unique “measure of faith” (Romans 12:3). Not every Christian possesses the same gifts, and a profound sense of assurance is nothing if not a gift. Those blessed to have this gift are to enjoy it without boasting (1 Corinthians 4:7), and they bear a special responsibility to encourage those who do not possess it. For those not set free dramatically from their fear and mistrust, joy often requires a good bit of “reverse audio engineering.” Many different voices reside in our heads alongside the Spirit’s, and they speak both truths and lies. These voices blend together so that it is not always easy to recognize their origin. This is especially dangerous in the case of voices that shout words of accusation, rejection, and shame. What Voices Do You Hear? The accumulated insults, slights, and rejections that each person suffers in this life can make the words of Scripture and the Spirit’s echo of them hard to believe. Our own inner voice often mimics these outer voices of accusation. Who hasn’t cursed themselves after receiving criticism in moments of weakness, failure, or embarrassment? Who in their hidden thoughts hasn’t heaped shame upon themselves after being turned down from a job, or turned away by a friend or spouse? In doing this we are accepting human testimony about ourselves. But should we not accept God’s testimony instead? People often give good answers to this question only to see them fail to provide any relief. That is because you cannot give an honest answer to a dishonest question. This question, which tortures so many Christians, demands a new word from God instead of trusting and rejoicing in what he has already spoken. To the one asking, it sounds like it comes from within – from his own mind and conscience. On the contrary, it springs from a different voice, one that will never shut up and listen to God much less believe him. This voice always doubts, always raises objections, always turns our gaze inward instead of outward to Jesus, and always suspects that there is a catch hidden somewhere in the fine print of the Gospel. It is nothing less than the voice of the devil speaking in his native tongue. And as Jesus taught us, when the devil speaks in his native tongue, he lies. The most dangerous part of the devil’s work here is that he can make the voices of accusation – our own and those we have heard – seem like God’s own voice. Disparaging and dehumanizing words first spoken by others and then adopted as our own can be “baptized” by the devil. He will remind us of our sins and insinuate that no true child of God would ever commit them. He will direct us to the wrong passage of scripture at the worst possible moment, solidifying the impression in our hearts that we are outside of God’s family and favor. He will orchestrate a careless or hurtful word from a Christian we deeply respect, as though God were confirming our worst fears through a messenger. What must we do when the devil’s voice starts to sound like God’s voice? How can we tell the difference? The answer is simple, if not always easy: get to know Jesus. If we want to know who God is, what he is like, and what he has in mind for us, then we need to look at Jesus. The prophet Isaiah said that Jesus would be the kind of person who never breaks off a bruised reed or snuffs out a smoldering wick. When Jesus came, his every word and action confirmed this prophecy. He delighted in welcoming people who were crushed by their sins and weaknesses. Even though he spoke hard words to the rich, the proud, and the self-righteous, he did so because he desired even their presence in his kingdom. Indeed, many of these natural enemies came to embrace him in the end. Desire for sinners to come to him, and delight without disparagement when they do; this is Jesus. This is God. Any voice that speaks differently comes from the evil one. When you have trained yourself to recognize God’s voice you can begin to tune out those voices that contradict him. Debating these voices and their accusations accomplishes nothing. Imagine a woman in a crowded airport filled with all manner of noise. She has returned from a long and arduous work assignment overseas. In the distance she spots her husband who is there to meet her! Suddenly the cacophony around her begins to fade. The noise is still there, but it does not register in the same way. All that matters to her now is reaching her husband. As she walks, then runs, she begins to hear his voice in her head, carrying on a conversation even before they embrace. Words that she has long desired to hear from him now arise in her heart even before they have been spoken from his lips. When at last she embraces him, and he says to her, “I love you and I’m so happy that you are home,” she hears nothing else at all. Instead of believing or even arguing with the voices of accusation, learn to cry out “Abba, Father!” The lies of the devil cannot withstand the joyful words of the Spirit. Learning to hear and trust the voice of the Spirit as He speaks in Scripture and in our souls is incredibly liberating. However, just listening to the Spirit’s song is not enough to keep the melody in your heart. In order to experience joy regularly, we must sing the words of the Spirit to those around us. Why? Because we have drowned out the voice of the Spirit in their souls. We have all insulted people, in effect declaring that they have no value. We have judged people according to their appearance, skills, or usefulness to us, disregarding the glory of God that is stamped on every one of their cells. We have selfishly taken from people for our own gratification, enjoying their work, their money, and even their bodies without gratitude, praise, and mutual giving. We have failed to give hurting people our time, energy, and care, or we have done so grudgingly. We have been physically abusive of some, and neglectful of others. When we claim and constantly reclaim the truth of being the chosen ones, we soon discover within ourselves a deep desire to reveal to others their own chosenness. Instead of making us feel that we are better, more precious or valuable than others, our awareness of being chosen opens our eyes to the chosenness of others. That is the great joy of being chosen: the discovery that others are chosen as well. In the house of God there are many mansions. Healthy Christians who sing with the Spirit long to strengthen the voices of their brothers and sisters, because they realize that their own joy can never be full or lasting without others sharing that joy. They desire just as much to hear new voices, those of people who have not heard or have not yet believed the word about Jesus. They fight to suppress the voices of accusation that arise from poverty, neglect, and abuse, and that keep so many of God’s image bearers in chains. Churches with rich fellowship, bold evangelism, and compassionate care of the poor are churches filled with Christians who have learned to be still long enough to hear and sing the song of the Spirit. They are refuges for the guilty and shamed, families for the lonely and abused, and rehab centers for the proud and violent. They are symphonies of joy. Linus repeats the “glad tidings of great joy” spoken by the angel to the shepherds. Each week of Advent is special, but the third week stands out from the others. For one thing, it’s marked with a different colored candle – pink instead of blue. More importantly, it introduces a note of celebration that is muted in the other weeks of the season, because the third week focuses on joy, the simple delight and happiness in what God has done through Jesus. It takes strenuous effort to grow in hope (week 1), to cultivate peace (week 2), and to deepen faith (week 4). In all three cases we must swim against the tide of the world, resist the weakness of our sinful nature, and bear up under the opposition of the devil. If this were all that Advent had to offer, it might weary our souls just as winter wearies our bones. But thankfully there is more! For nestled in the middle of the Advent season, this reminder of the joy that is in Jesus gives us a Sabbath from the glorious yet hard work that comes with waiting on God. The angel who told the shepherds of Jesus’ birth called his message “good news of great joy” (Luke 2:10). After rushing to Bethlehem and seeing the infant king, the shepherds returned to their flocks “glorifying and praising God for all they had heard and seen” (Luke 2:20). On that night the wonders that Jesus would perform and the lessons that he would give lay three decades in the distance, yet the shepherds still rejoiced. Why? Because the birth of the child guaranteed the works to come. For them, that was enough to cause delight and praise to erupt from their hearts. Like the shepherds, we anticipate great things from Jesus without knowing when they will occur. Our joy will not be complete until Jesus returns, but that hardly suggests that the joy given to Christians in the present is a paltry thing. In fact, we have greater reason for joy than the shepherds and much greater ability to rejoice, for Jesus has been raised from the dead, the firstfruits of a universe to come that will never know sin, decay, and death, and where God will dwell with mankind forever. Jesus has promised that we who follow him will share in that new creation. He has confirmed that promise by giving us the Holy Spirit, and the Spirit delights to bring joy. Unlike the shepherds, we do not need to run in haste to see Jesus; we hear him from within. Jesus has now come to live in us through the Spirit, and the Spirit prompts us to rejoice in response to God’s word about Jesus. Just as an infant in the womb moves when she hears her mother’s voice, so the Holy Spirit who resides hidden in our souls answers the voice of the Father when we hear or read the Scriptures. The Spirit responds to the word with joy and calls our spirit to join in the celebration. Healthy Christians in turn recognize the voice of the Spirit within, listen in wonder as to a beautiful melody, and lend their voices to the song. What greater reason for joy can there be than to know that you – yes, you – will share richly in God’s new creation as Jesus’ sibling and the Father’s child? That everyone you worship with each week will also share in this glory? That those you mourn who have fallen asleep in the Lord have not been forgotten, but are even this moment beholding the face of the Father and the Son? That untold multitudes of people of every class, race, language, and nation will one day live, work, rest, learn, play, feast, discover, and worship in perfect truth and love? This and so much more joy is contained in that simple phrase that the Spirit whispers: “Abba, Father!” Such joy fortifies us for the hard work of sustaining hope, peace, and faith in this present age. Like a boxer who takes a shot to the jaw and smiles through the sting, a joyful Christian can relish trading blows with the world, the flesh, and the devil. The outcome is not in question, therefore there is joy in the struggle! …and yet this joy often eludes us. For some thoughts on why and what to do about it, read part 2.